Recently, Alice and Jared of Eat A Duck I Must and I bonded over Penang street food as the cute couple just came back from Penang not too long ago. After intensive tweeting about the subject of food, I invited them to guest post on Rasa Malaysia. Alice kindly accepted and offered their crispy pork belly/siu yuk (烧肉) recipe. Eat a Duck I Must (the name is as cute as the couple) is a great food blog about their eating trips and home-cooked meals. Other than working full-time, blogging, and traveling, Eat A Duck I Must also offers photography services. Please give your warmest welcome while you drool over their Chinese roast pork. If you wish to view their step-by-step photos, click on the gallery above. In the last few years, it seems that pork belly and bacon are making a big comeback on the food scene. Everywhere you turn, you see bacon—bacon dipped in chocolate, bacon mayonaise, pork belly sandwiches, braised pork belly, bacon ice cream, bacon wrapped bacon… (I blame you David Chang and Michael Ruhlman!) So to add to this pork belly craze, we have decided to make the popular Chinese Crispy Pork Belly (Siu Yuk/烧肉). 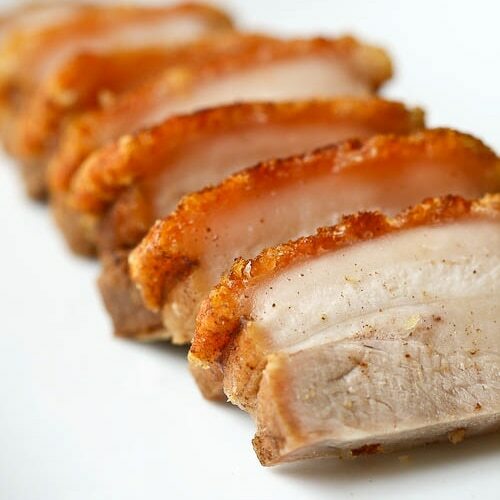 Typically, Crispy Pork Belly is a dish you would eat at Chinese banquets or pick up as carryout for a special occasion at home from a Chinese BBQ shop strictly dedicated to roasting pork, duck, goose and chicken over an open fire or wood burning rotisserie ovens. Growing up, this was one of my all time favorite dishes. The crispy crunchy skin crackles as you take your first bite only to reveal the mouthwatering fat that sits right below. And then at long last you taste it all together with the savory pork belly meat. It’s awesome. And if you plan on getting the belly meat from the BBQ shop, you better get there early as it is usually the first item to be sold out. The next best thing is to make your own. Now, we don’t all have the luxury of having a large rotisserie oven or an open pit constructed in our backyards so we’ve learned this homecooked version from Jared’s aunt. Jared’s aunt is one special lady. Thinking about her cooking makes me drool. Every time we head over there for a meal, there seems to be a huge feast with at least 6-7 dishes, not including the obligatory Cantonese soup. There usually isn’t a special occasion to celebrate, it’s just dinner. Our absolute favorite dish is her homemade crispy pork belly. Most homemade recipes call for the pork belly to be baked, which can take hours to crisp up the skin and can dry out the meat in the process. Jared’s aunt’s secret comes from frying the skin. This allows the skin to reach the perfect amount of crispiness in the shortest amount of time. Honestly, we’ve all started to prefer this homecooked version over the professional BBQ shop takeout version—and that is saying a lot! Jared and I spent the last weekend persuading her to divulge her secret recipe and we’ve tested the recipe at home to make sure it is foolproof. I present to you the Crispy Pork Belly Recipe!! Chinese roast pork belly recipe (siu yuk/烧肉) by Eat a Duck I Must. Crispy pork belly that you can easily prepare at home, including step-by-step pictures. Submerge the pork belly meat in a pot of water and boil for about 15 minutes on medium heat. Remove the pork and place it in a colander to let it dry for about 15 minutes. You may take the extra step of patting the pork belly skin dry with a paper towel for extra crispy skin. Stab the pork with a knife a few times and rub the spices and salt on the flesh only (not the skin). We recommend layering the spices in the following order: spiced ginger powder, 5 spice powder, white pepper, salt and optional msg. Let it marinate for 1 hour, though over night is better for a deeper flavor. In a dutch oven or a large cast iron pan, fill it with oil enough to cover the skin of the pork belly. Avoid using olive oil since it has a low smoking point. 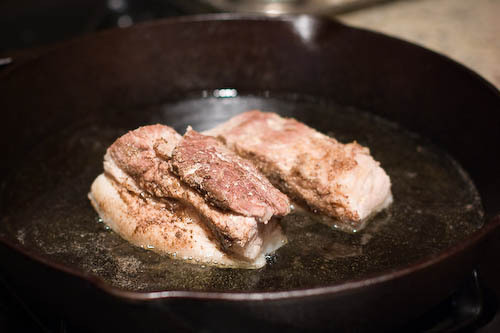 You can place the pork belly in pan while the oil is still cold to prevent splatter. CAUTION!!! the pork will splatter a lot, so it is better to use a dutch oven with a heavy lid or use a splatter screen to place over your frying pan. Fry the skin side first for roughly 5 mins or until golden brown and crispy, turn it on the side and fry it only for a min or two, repeat on all sides (it is best not to fry it on the flesh side for too long as it will toughen the meat) Frying is a skill learned over time, so if the skin is burnt, you can scrape it off with a knife. No worries! Let it rest until cool to the touch and cut into slices. Lingzie, my thoughts were the same before I learned how to make it, but this recipe is actually very easy and the results are amazing. I think the hardest part is fighting over who gets the last piece. Do try it and let us know if you have any questions. This crispy pork belly actually tasted really good with stir fried morning glory. Thought it was a bit plain to just wok toss the morning glory the thai way, so threw in some chunks of pork belly. I’ve been a lurker for quite some time and wanted to finally let you know how helpful I’ve always found your recipes. My husband and I adore traditional Asian recipes and between you and Jen Yu of use real butter we’ve got it made! It’s been especially fun since my husband learned Mandarin to add to his Korean – now I can drag him shopping with me to get the ingredients nearly anywhere! Again – thank you. I love your site and all your recipes. Soup dumpling is very hard to attempt at home; it’s something that I would rather eat out. Oh man, that looks amazing! I love good pork belly! Wow, this roast pork belly is definitely better looking than the ones in Chinatown!! Thanks for the recipe! I stayed awake all last night just dreaming about this wonderful crispy pork belly. YUMM!! Me wants some right now. This is making me drool! I really, really want to try and make pork belly but I have always been kind of intimidated, it is on my bucket list for 2010! looks amazing, can’t wait to give this recipe a shot! Thanks for sharing this siu yuk recipes. I will definitely give this recipes a try. They look wonderfully delicious, especially the crackling. Christine, I am glad you like the recipe. Once you try this, you will never go back to buying it from the BBQ shops. Let us know how it turns out. I tried your recipes today, it’s really delicious. I boiled the belly for only 35mins to ensure that’s not too tough and still tender, I marinated it overnight-the taste of spices more absorbed, and I did scores the skin with sharp knife and rub with some sea salt. Yes frying the skin is a bit of oily mess but the end result is worth it. I will try using cast iron pan with heavy lid to fry next. Christine, thank you for trying our recipe. Yes, it does get kinda messy, which is why I fry it in a dutch oven or a cast iron pan with a heavy lid to prevent splatter. Fresh Siu Yuk made at home is so much better than store bought, glad you liked it. Delicious looking. The recipe is very different from the traditional siu yuk recipe though. But who cares as long as the end result is the same. LOL! I love this stuff! The method is a great one. I’m going to adapt it for the Mexican restaurant I work in by changing the spice profile. It will be a wonderful bar snack served with some pickled vegetables. That’s why I cook mostly Asian and Latin cuisines..both have a deep and abiding appreciation of pork! Just what I’m looking for… thanks. What is spiced ginger powder? Spiced ginger powder is grounded up ginger powder you can get at Asian grocery stores. Kudos to you!! I’d like to make siew yoke someday because my entire goes nuts for it LOL!! Thanks for sharing!! First of all, thanks for the great recipe! I always craved Roast pork and always thought of making my own but failed at several attempts to make the skin crispy. I’ve tried your recipe and it tasted great. The only thing I would say is that the meat was slightly hard but still edible. I tasted the meat after it was boiled and it already tasted kind of chewy. Is there a way to tenderise the meat before boiling? Vinnie, i am glad you tried the recipe and liked it. One thing you can try is to stab the meat with a knife to tenderize it prior to boiling. Also, you can try reducing the boiling time to 30 mins. Jared, I think the only time I’m really happy is when I’m cooking,I seem to be in a world of my own trying different foods experiencing different tastes and flavours from all around the world I just love food sorry to sound so dramatic! !.After looking at you’re recepe for roast pork belly I’m a bit confused after the boiling stage?when ever I’ve cooked belly of pork before I like most people have roasted it slowly for hours and find it so hard to comprehend that it can be cooked in such a short time! !.After the boiling stage do you then submerge it totally in oil skin side down how does the skin get crisp? Maybe it’s the way I’m reading it?i need youre help thank you . You shared a recipe for char siu on april 19, 2009. You used chinese rose wine. Do you mind if i ask why and why not just use a regular bottle of cooking wine? I have to go around town now to look for chinese rose wine and i cant find it. Another recipe you shared requires the use of chinese rice wine. :-( Grrr. Problem is i’ll probably use both types of wine maybe once or twice in a whole year if i’m lucky. Chinese rose wine has a very intense aroma which is great for some dishes such as char siu. If you can’t find it, then use regular Chinese rice wine. Hi Jared, Thanks for the great recipes. Mr. Wood, thanks should be given where & when it is needed. If the recipe asks for a certain ingredient & you find it troublesome or have difficulties looking for it, then do not try it. Remember you cannot expect everything to be handed to you in a silver platter. If you think that it’s wasteful to buy something when you will only use it once or twice, then forget about it. I have tried recipes where I had to look into a dictionary to find out what some of the ingredients were, but I did go about complaining to anyone. I am not trying to be nasty, but we need to be thankful to the person who has generously shared his recipes with all of us. I boiled it for about 30mins, dried it for about another 20mins and then proceed to marinate it. I couldn’t find the spiced ginger powder on such short notice (I saw your siu yuk recipe this morning before I went to the market) – so I used ginger juice instead. I’m still an amateur but the siu yuk turns out very well. Thanks for this recipe! Easy and amazing result! home made siu yuk couldn’t be easier. Many thanks again my hubby was delighted, the Malaysia flavour come to Lyon with this dish. hi, its me again :) from dubai. we also have crispy fried pork belly recipe in the philippines, it is known as lechon kawali. here is what i do. i just wanted to share with you. boil pork until tender, drain water, leave out to cool. once it is cool, put pork in a ziploc and freeze for a few hours. just thought you would find it interesting. Undoubtedly the best asian/chinese food blog I’ve come across in about 6 months of on/off searching. Thank you so much, please keep up the great work. Thank you for sharing your recipe. Today I christened my new La Creuset dutch oven with your crispy pork belly recipe. The end result was great and fed three adults. You were right with your caution – the oil really splattered everywhere whenever I lifted the lid for a peek or to turn the meat. My tip is to wear kitchen mitts on both hands plus cover your forearms with tea towels to prevent oil splattering your arms. The steps I modified were to boil the pork for 30 mins, then stab the meat all over before rubbing the spices on it. I also left the meat to marinate in the fridge overnight (with the skin side up) uncovered. I’m not sure how you kept your pork belly edges all neat, flat and square when frying, but when I started cooking the belly in the vegetable oil, I took it out and cut my piece in half and then reinserted both halves (skin side down) back into the oil. I did this as the pork skin wasn’t flat and so only the middle bits were crisping up, leaving the edges ‘un-crispy’. Would placing a plate over the belly, with a heavy weight on top of the plate, during the marinating stage, perhaps help level out the pork belly skin for frying? or does this affect the layer of fat under the skin? Happy to hear your feedback. Thanks again for a great recipe. All the best. Excellent recipe. Thank you for making it available. I tried it successfully, today. I used a 1/2-lb. piece of pork belly that I had cured in salt for five days. I therefore cut back on some of the dry seasoning, but otherwise followed the cooking times exactly. Got a picture-perfect, brown crispy skin and was pleased to learn that the boiling returned enough moisture to the cured belly to keep it from drying out while frying. I served the belly sliced on top of oven-baked polenta (Joy of Cooking recipe, with cheese). Check this sui yuk recipe. looks good. This receipe looks very good. this method may also not burn the skin. I can’t take any recipe seriously that adds MSG. MSG is optional in this recipe. I can’t take any person seriously that doesn’t really understand MSG. I was captivated by the photo & had to try this recipe. Tasted SO good we will definetly enjoy having it again. When you say boil the pork, do you put it in cold water then boil to boiling point or put the pork in when the water is boiled? Boil only when water is boiled. Looks like a terrific recipe. I love pork belly and recently found the meat for sale at our local Asian grocery. Will have to try it soon! One question – a couple of comments talked about reducing the boiling time to 35 minutes or 30 minutes. But if I’m reading the recipe correctly, it only calls for boiling the meat for 15 minutes. Can you clear this up for me? Thanks – great blog btw! my interest in bbq pork started when i saw a video clip of chef gordon ramsay making pork belly…he’s good..but i am going to make a better dish ..to show off when i entertain my neighbours in the backyard during summer bbq.. I think there may be an error in this recipe which is making the meat tough? The detailed recipe says to boil for only 15-minutes, but the comment under photograph #4 says to boil for a full hour? Thanks! This is one good website. I specially like the pictures for every procedure. Good Job! hi, where can one get the spiced ginger powder? Like @saychinso, I am also curious to know where you can buy spiced ginger powder? What is it exactly? Is it the same as dried ginger powder? Thanks! Do you think it was the fry time or do I need hotter oil? In the ingredients, did you mean Garlic powder instead of Ginger powder? Thx. May I know what spiced ginger powder is? I couldn’t find it at the Asian Mart. They only have ginger powder (薑 粉). Is there any difference between the沙 薑 粉 and薑 粉? I would never thought to make my own shiu yuk. I am originally from Msia and has lived in US for 15 years now. I used the recipe from your Rasa Malaysia book. The roasted version vs. this deep fried recipe. It was simple and came out awesome. Better than some of the shiu yuk you get from the store. The trick is the preparation of the skin.. lots of hard work and it does pay off. I made it twice for parties for local friends here, that is one of the crowd favourite. Thanks for the recipe. SooWai, so which version do you prefer, the roast or fried? I usually roast mine but I am thinking of trying this method. Thanks! Hello, the slideshow above specifies a 1 hour braise for the pork belly, but the recipe specifies 15 minutes. I can only imagine that a 15 minutes braise will give you a very tough belly. Something is not right ! Thanks. looks so good… i really want to try this! but how hot should the oil be? thanks! 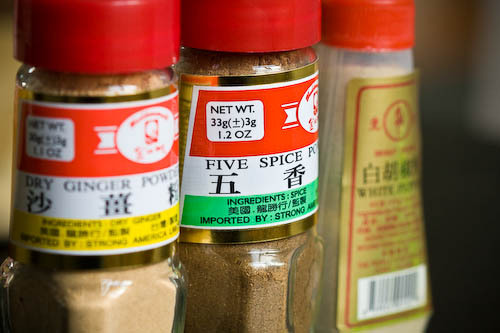 What is Spiced Ginger Powder ?Where do I get it? I am also curious about the cooking time – 15 min in the recipe vs 1 hr in the photo slides. And also, what is the difference between the two kinds of ginger powder that a previous comment mentioned. Thank you! It looks like a beautiful, delicious recipe. It should be 15 minutes. The original recipe was 1 hour but revised down to 15 minutes. Hei, tanks a lot for your Nice recipe. But can you let me know how hot should the oil be??? Hi.. May I know what’s the temperature for oven? cool.. i like this web.. allow me to cook all the food i cant get in germany(i’m from malaysia) since i’m sudying here…malaysian’s food… deabak!!! Can i use a regular oven? If yes, may i know the temperature and how long should i cook it? Hi, may I know where can I get the oven-roasted version of Siu Yok? Thanks! I will share the recipe soon. i am also a penangite living overseas but pregnant now so craving unusually badly for penang and mommy’s home cook food. thank goodness i come across your recipes and get very tempted to try this out, but i also read another blog on roasted pork belly emphasizing the thickness of fresh pork belly not less than 1.5-2 inches. in italy where i live, the pork belly is usually ~1 inch thick and the butchery confirmed not having come across such thick belly i need in italy. question to you, does thickness matter in your deep fried version of pork belly? will 1 inch be fine? What is spiced ginger powder? Is this different from regular ground ginger? Where can I find it? Asian grocery stores, it’s different from ginger powder, it’s sand ginger powder, a different type of ginger.